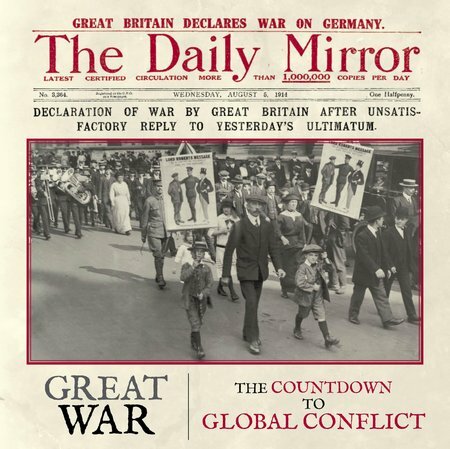 DESCRIPTION: The publisher has already produced a number of books that are based on the stories published in the Daily Mirror. The result is a fascinating new insight into a major event through the eyes of journalists who were there. It also includes many photographs that provide a direct sight of events. There may yet be new theories about the start of the Great War and clarity is important at a time when events may yet trigger a similar holocaust. However, the general consensus is that the Great War came about primarily through a series of misconceptions and errors of judgement by the politicians at the time and through the personal ambitions and hatred of the Kaiser. As the EU attempts to rewrite history, it is dangerously close to replicating the conditions of 1913 and 1914. The envy of the Kaiser who wanted to create a duplicate of the British Empire for Germany created an arms race with Britain that was likely to lead eventually to war. What it required was a trigger and the unrest in the Balkans was to produce that trigger. Even then, war might have been averted had not a series of mobilizations moved Europe to war. This new book takes the reader on the road to war, reflecting the nationalism of the times and the fervour of people across the social spectrum and the nations of Europe. The book format paints a vivid picture and this book deserves to be widely read.